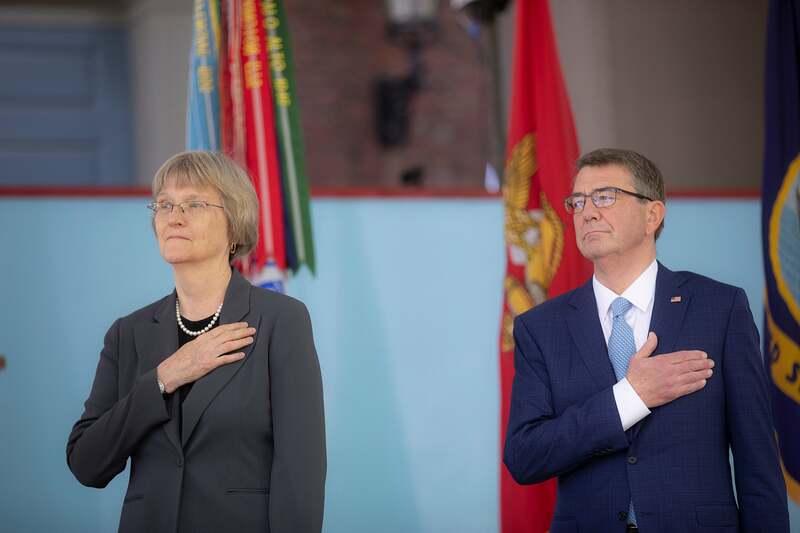 Belfer Center director Ash Carter congratulates Nathan Williams '18 during the ROTC Commissioning Ceremony during 367th Harvard Commencement. The ROTC commissioning ceremony Wednesday at Tercentenary Theatre saluted the long Crimson line of Harvard students who have joined the military. Eight years ago, Shawna Sinnott ’10 received her commission as a Navy second lieutenant at a ceremony attended by Harvard President Drew Faust. In January of this year, Sinnott, now a captain in the Marine Corps, sent Faust an American flag she had flown for her in Afghanistan. The same flag took center stage at Wednesday’s event. Faust brought the Reserve Officers’ Training Corps back to campus in 2011 after a nearly 40-year absence. In her speech, she highlighted Harvard’s long tradition of service to the nation. Daniel Cord (from left), Nathan Williams, James Joyce, Kevin Zhu, Michael Haley, Phillip Ramirez, all '18. The ceremony recognized two Army second lieutenants, two Marine Corps second lieutenants, and three Navy ensigns. Army 2nd Lt. Daniel Cord, who graduated with a master’s in Middle Eastern Studies, will serve as a military intelligence officer at Fort Devens, Mass. Army 2nd Lt. Nathan Williams, a government concentrator, will attend the engineer officer basic course at Fort Leonard Wood, Mo. Marine Corps 2nd Lt. Kevin Zhu, a visual and environmental studies concentrator, and Marine Corps 2nd Lt. James Joyce, an economics concentrator, will attend the Basic School in Quantico, Virginia. Ensigns Michael Haley, an economics concentrator, and Phillip Ramirez, a government concentrator, were selected for aviation duty and will report to the Naval Air Station, Pensacola, Fla. Ensign Kirstin Anderson, a physics concentrator, will report to Charleston, S.C., to be assigned to the Naval Nuclear Power Training Command. The new officers swore an oath to the Constitution and received their first salute; their relatives pinned their insignias to their uniforms. When the ceremony ended, the warrior-scholars were embraced by families, classmates, and friends. Phillip Ramirez '18 is honored by his dad, Maj. Steve Ramirez (retired), his mother, Lisa, and his grandfather, Herb Drees, a veteran of the Korean War. Asked why he joined the military, Zhu, who grew up in Boston, said he was moved by a desire to give back.